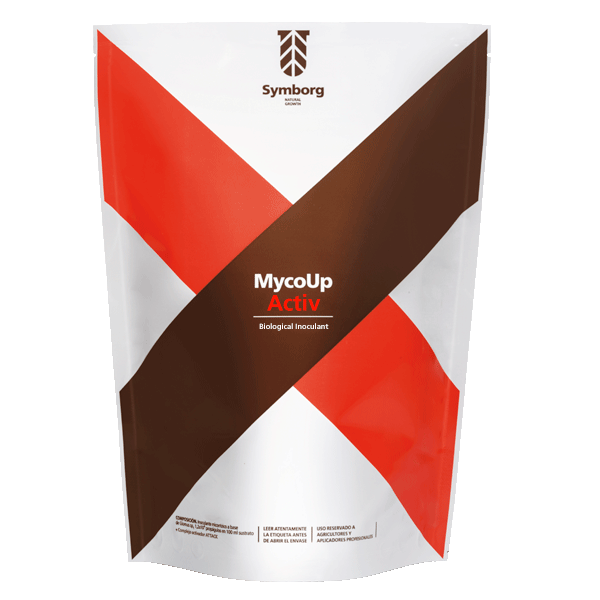 MycoUp Activ is a biological inoculant product for agricultural use, based on the mycorrhiza forming fungus, Glomus Iranicum var. tenuihypharum var. nov., which actively promotes an intense mycorrhizal colonization, resulting in increased root growth and improved plant vitality. The application of MycoUp Activ leads to a more efficient transfer of water and nutrients from the soil, increased resistance to external factors, resulting in greater crop yield potential, enhanced physiological activity, and improved fruit quality. MycoUp Activ is very effective in intensive agriculture particularly in high saline soils or impoverished soils caused by industrial agricultural practices. MycoUp Active contains the only species of mycorrhizal forming fungus that can be applied directly through irrigation systems without having to remove filters. MycoUp Activ’s advanced formulation promotes the microbial activity in soil, stimulating the development of the rhizosphere and providing biological balance of the soil for the plant to develop optimally. MycoUp Activ contains the specific strain Glomus iranicum var. tenuihypharum var. nova. with 1.2 x 10^4 prop/100 ml and 3.14% (w/v) of iron. MycoUp Activ can be applied to all crops except Chenopodiaceae, Cruciferaceae (cole crops such as cabbage, cauliflower, broccoli), Fumariaceae, Cyperaceae, Commelinaceae, Urticaceae (nettles) and Poligonaceae (buckwheat, rhubarb). Horticultural crops (greenhouse, field, hydroponics): dosage 2.5 lb/acre, 7 days after transplanting. Strawberry: dosage 2.5 lb/acre, 20 days after transplanting. Woody crops (citrus, pome and peach, apricot, almonds, walnuts tropical and subtropical trees, olive trees, grapevines, etc. ): dosage 1.5 lb/acre at early flowering in young orchards 2.5 lb/acre at early flowering in full productive orchards. For long crop cycle it is recommended a second application with a rate of 1.5 lb/acre after 70-90 days since the first application to maintain biological balance of the soil for the plant to develop optimally. MycoUp Activ is not recommended to apply together with any other type of product. MycoUp Activ is compatible with most of the soil-applied fungicides available on the market currently. None, MycoUp has a 0-Day Pre-Harvest Interval and can be applied up to and including the day of harvest. MycoUp Activ can be stored at room temperature for up to 24 months. For longer periods, store in a cool dry place in its original packaging.